Sarah Greenough, “Alfred Stieglitz/A Decorative Panel/1894,” Alfred Stieglitz Key Set, NGA Online Editions, https://purl.org/nga/collection/artobject/35252 (accessed April 26, 2019). In September 1894 Stieglitz wrote: “The Ross-Zeiss lens attached to the large camera I use does excellent work; for example, on a rainy day using stop f/12 on a Lumière plate I took a picture in 1/5 of a second of some black goats distant from the camera, 15 feet, which developed, fully exposed” (The American Amateur Photographer 6 [September 1894], 432). 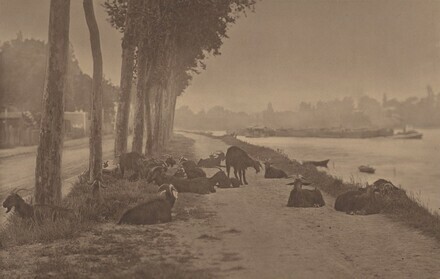 In the 1895 London Photographic Salon, Stieglitz exhibited a photograph titled Along the Seine, which was praised by George Davison for its “decorative effect” (see The American Amateur Photographer 7 [November 1895], 491). The title A Decorative Panel may derive from this description. Greenough, Sarah. Alfred Stieglitz: The Key Set: The Alfred Stieglitz Collection of Photographs. Washington, 2002: vol. 1, cat. 118.